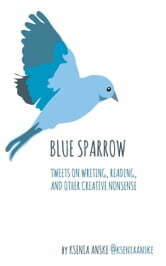 Blue Sparrow was born on Twitter. It's a compilation of my daily ramblings as a first time novelist encouraging myself and other writers to bite the bullet and do it despite the fear of blank paper, the insecurities, the angst every writer faces when left alone with the story and trying to bleed it out. My Twitter followers asked me to make it. They said they want to carry it around in their pockets and take it out each time they felt stuck, scared, or simply need to smile. Because people tell me my tweets are funny. You be the judge.